C Difficile Infection and Antibiotic Colitis are two names for the same problem that are side effects of antibiotic use. C difficile Infection is the shortened name for a gastrointestinal infection from a bacteria called 'Clostridium Difficile'. Clostridium difficile, also called C Diff, lives in everyone's digestive tract in small numbers and is kept 'under control' by the Good Bacteria in our digestive tracts. 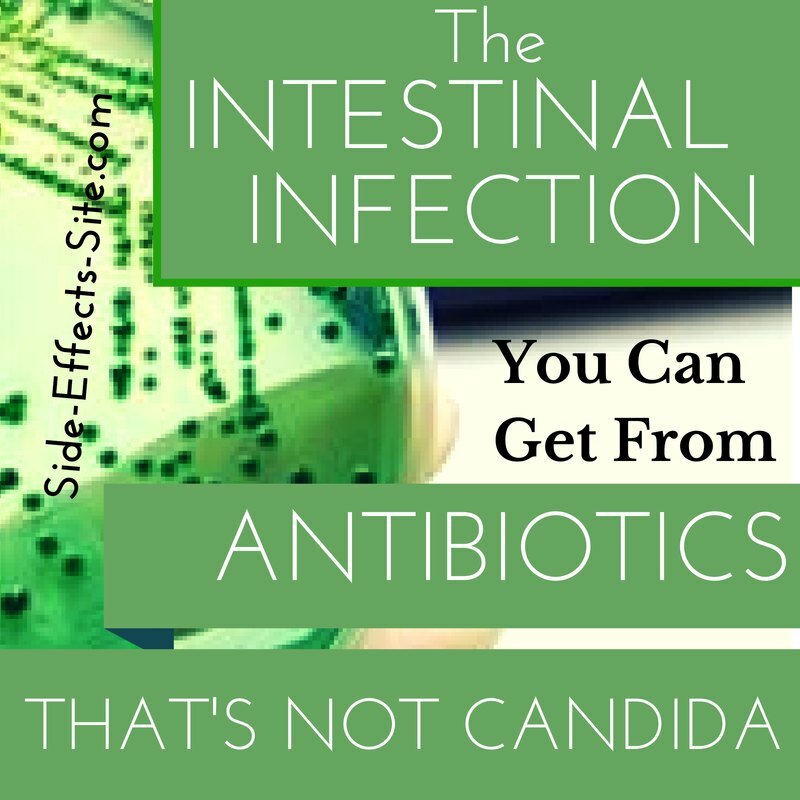 But when you take antibiotics, the bacteria that are causing your infection are killed, but so are many of the bacteria in your digestive tract. While C difficile infection and antibiotic colitis are certainly funny names, their infection is no laughing matter. C diff infection is usually a result of Antibiotic Associated Diarrhea,can lead to chronic diarrhea, stomach pain and even intestinal damage that requires surgery if it is not recognized. While it is often recognized as an Antibiotic Side Effect in the hospitalized patient, it is almost NEVER recognized in people who are NOT hospitalized- especially if they do not have chronically loose stools. But if you have taken antibiotics before- especially if you have taken any of the Quinolone Antibiotics- and have any lower digestive problems, then you could have a 'subclinical' C Diff Infection. Is C Difficile Infection Contagious? Absolutely. Antibiotic colitis can be passed from person to person through the stool (bowel movements). In the hospital, persons with C Diff Infection are 'isolated' in their rooms- meaning that special precautions are taken in order to prevent the spread of the organism to other patients. Good handwashing, particularly after using the bathroom, is ESSENTIAL- as is keeping the bathroom that the infected person uses particularly clean. If possible to do so, it is a good idea to ask the infected person to use a designated bathroom that the rest of the family does not use and cleaning it well with antiseptic after the infection is gone. Unlike many other bacteria that are directly grown on a petri dish or looked at under a microscope, C difficile infection is diagnosed based on the presence of the 'C diff toxin' that is able to be detected on a stool sample. This test is so easy that the testing materials can actually be just sent to your home and you can mail it back to the laboratory- it can even be done to painlessly test children as well. Few doctors do this test, though, unless you have obvious symptoms such as lower abdominal pain and chronic diarrhea. But you can order a C Diff Toxin Test as part of a Comprehensive Intestinal Pathogen Test here. It is recommended that you get the entire pathogen test because even though it may SEEM like C Diff infection, it could be any number of pathogens that are causing your symptoms. Getting a comprehensive test that checks for many different pathogens can save a lot of time and energy trying to find out what your problems is. First: The first and best way to treat a C Difficile Infection is to NOT take antibiotics in the first place. While antibiotics have saved thousands of lives and have been one of the medical miracles of the modern world, they are also contributing to some of the problems of the modern world as well. Having a predominance of 'bad' organisms to 'good' organisms in the gut, which is almost always caused by antibiotic use, is causing not only C difficile infection, but also Intestinal Candida Infections, Antibiotic Resistant Bacteria like MRSA, and other problems that may be contributing to the epidemic of chronic health problems that first world countries are experiencing. So, do you REALLY need to take those antibiotics in the first place? Is it worth contributing to the worldwide spread of drug resistant organisms and taking the risk of getting a Candida or a C Diff Infection- or even a permanent disability such as Cipro Tendonitis- for the perception that you are 'doing something' for your illness- when often your body will heal the infection on its own? Second: If you decide that you really DO need to take that antibiotic OR you have already started taking the antibiotic before you had this information OR you have already completed the antibiotic, then you still have some options to prevent and/or help to get rid of a C Difficile Infection. While many people are familiar with taking PROBIOTICS to prevent the problems associated with antibiotics killing off the good bacteria, you need to take a SPECIFIC organism to prevent C Difficile Infection. The organism and supplement called Saccharomyces Boulardii is a very specific probiotic that has been shown in many studies to help prevent antibiotic associated C difficile infection. So, taking a probiotic with multiple strains of good bacteria in a high quality probiotic supplement, such as Garden of Life Probiotics, will help to ward off Candida Infection and 'general' bacterial overgrowth infections. But it's also a good idea to take a probiotic that SPECIFICALLY has high dose Sac Boulardii all by itself. Most combination products simply don't have a high enough dose of Sac Boulardii to make a difference. First of all, you need to find out for SURE if you have a C Difficile infection or if it is potentially another parasite, or even an Intestinal Candida Infection. And the only way to do that is to get a C Diff Toxin Stool Test. You can order the test as part of the Comprehensive Intestinal Pathogen Test. You receive it in the mail, you mail it to the laboratory, and then you will get a call to discuss your results. If you have already been tested and you are positive for a C diff infection, if you are working with your physician- you are likely to get MORE antibiotics and antifungal medications to get rid of the infection! But you can also choose to use Saccharomyces Boulardii by itself or in addition to prescription drugs in order to get rid of the infection. Be sure to ALSO take a High Quality Probiotic Supplement with any Antibiotic Colitis Treatment regimen that you choose. After finishing the treatment, you'll need to wait a month and get a C Difficile Toxin Stool Test again. Don't skip this step as it is extremely important to make sure that you have eliminated it completely. Antibiotic Colitis is NOT something that you want to guess as to whether you have effectively eliminated it or not because untreated, it can lead to severe intestinal damage that could even require surgery for! Don't make that mistake, do it right the first time and get tested before and after!